- I’m enjoying shopping for fabrics for my new Bhutan dress code wardrobe! Blog post to come! - I love being surrounded by green slopes at all times in the city. - People see me on the street in local dress and they stare for several moments… then eventually give me a slow, wide smile. Sweet. - I’m starting to recognize people around town other than my co-workers. - Have I told you lately how much I love cheese momos with eezay? - Not only is health care free in Bhutan but the prescriptions are free, too, even for foreign visitors! - My apartment has cable TV, about 25 channels mostly from India. I watched a lot of TV when I was sick. It’s fascinating to watch shows, movies and especially ads from a country I have never been to. The ads for products I cannot recognize, referring to social customs I’m unaware of and featuring mega-celebs I’ve never seen before – these ones shake me up and remind me of how much I don’t know about the world. - After living in a basement for 16 months, I am so delighted to have a view! - My furnished apartment was furnished with bed bugs. - Related: I am covered with insect bites, either mosquito or bed bug. - I seem to have popped my jaw in a weird way because my teeth can no longer bite together. - I often feel my heart racing at times even when I’m at rest. I wonder if this is a normal part of moving from an altitude of 150 m a.s.l. to over 2300 m a.s.l. Will this gradually stop? - The bureaucratic hurdles are rather exhausting. My banking issues are presently being turned into a newspaper article. - All the smoking in the office is very unpleasant. I thought cigarettes were banned in Bhutan! - I miss high quality baked goods. And boneless chicken. And spinach salad. And good chocolate. - I owe e-mails to, like, everybody especially my best friends and co-workers. Big apologies. Update! Local experts tell me that I probably don't have bed bugs but that the bites are probably from fleas! I don't know if this is better or worse. Also, although I included several things on the MINUS list, overall I'm definitely enjoying my time here. I am enjoying reading about your adventures soooo much! Now bed bugs? What? Those things get into everything! Have you gotten everything fumigated? Holy hell that would drive me insane. You are such a trooper! Yes, the altitude can do that to you. You will adjust. Just take it easy and get plenty of rest. You were also sick on top of it all! Hi Andrea, I had one friend from Singapore who merely survived in Bhutan for a year, he didn't like anything; complained about almost everything that were inefficient. He was honest though. 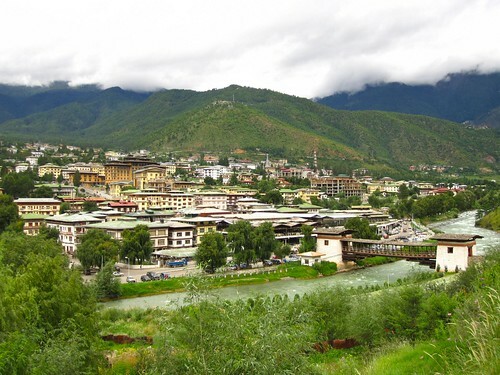 But looking at your view, if not for the bedbugs, I realized it takes an adventurous soul to like Bhutan. About your racing breath, it is normal, yes it is because of the change in altitide, it can become worse as the winter sets in...but by then I hope your lung will agree with the fact. There should not be bedbugs in Thimphu, I don't know where you are putting up, nor should there be lots of insects... as the winter comes in they will set you free... but cold will be a problem....prepare yourself.